I am Tom Allen representing the King Chamber of Commerce. Tonight I would like to make a few comments about the budget for 2014. The budget exercise is incredibly important in that it is all about ensuring the financial sustainability of the Township is solid. As such, we would encourage a balanced budget at the end of the exercise so there is no increase in debt due to ongoing operations. Let us focus in on the economic portion of the sustainability plan. Our local economy with particular emphasis on the agriculture sector, tourism and village prosperity is key to the overall sustainability of the Township. In October Council approved the Community Improvement Plan that was presented by Economic Development. We supported these plans in principle in October and today we support spending on these plans as an important priority for 2014. As well, development of the tourism sector is deserving of funding. Our location makes us a great destination for what some call ‘small t’ tourism; the day trip type of activity. We have a many festivals and event in the Township that could be leveraged to help the tourism sector. Economic Development should have funding to develop this support in 2014. Again this year the King Chamber of Commerce is interested in publishing a third annual business directory. This publication supports the ‘shop local’ mindset by providing a very easy to use resource for residents to connect with local businesses. One other area that is important to the business community is the ongoing improvement and maintenance of our infrastructure. I see additional funds being focussed on infrastructure which remains a high priority. Overall the annual budget exercise clarifies priorities. While you will have heard and will continue to hear requests for additional spending we urge Council to keep a keen focus on the financial sustainability of the Township. Youngsters in King will be smiling this Christmas, thanks to toy collections in aid of the Nobleton Christmas Drive. 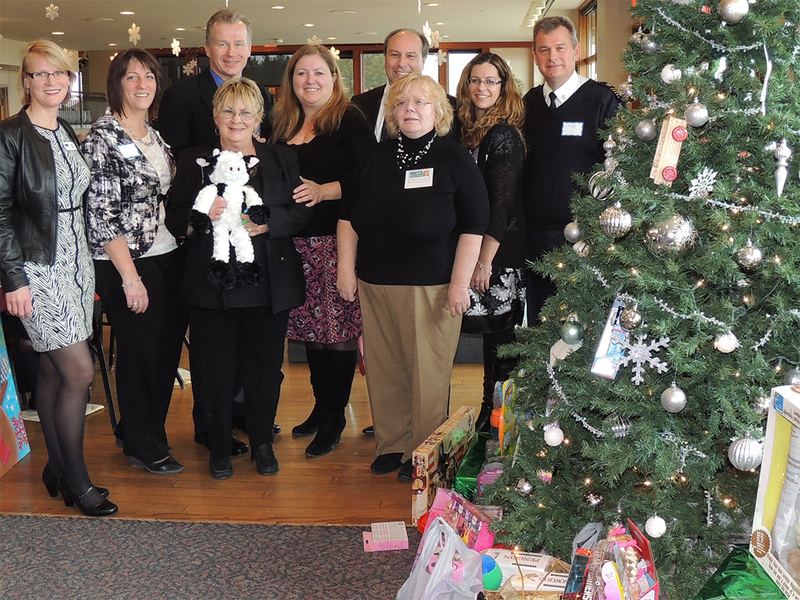 The King Chamber of Commerce held its annual Christmas lunch last week, collecting toys for the drive. King Fire and Emergency Services gathered up the donations and will donate them to the Nobleton campaign, which supports needy families across the municipality. Nobleton Christmas Drive has been going for almost two decades, thanks to Mary “Mimi” Buchanan. She does this without much fanfare, according to Chamber president Lucy Belperio. It’s a pleasure for the Chamber to support these families. 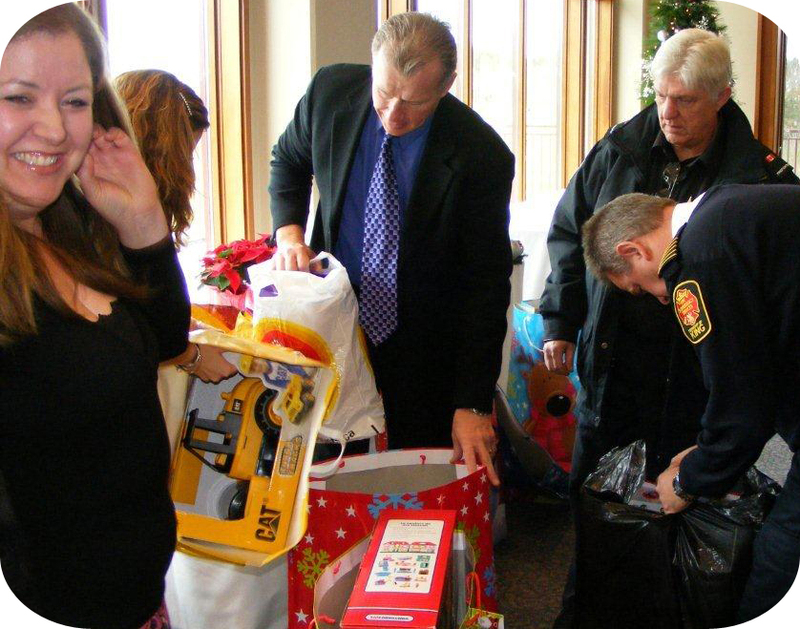 King fire chief Jim Wall said Buchanan is “an amazing lady” who’s a real “trooper.” Firefighters collected 50 toys from the recent Christmas in King City event, and they’ll add those to the Chamber donation. For more on the drive, contact Buchanan at 905- 859-5456, or email her at mimi_girl)93@hotmail. com. 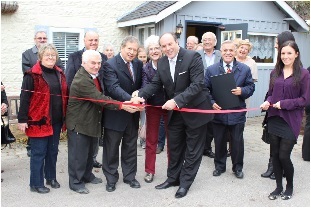 Lorenzo Lorenzini, staff and local patrons for the o0fficial ribbon cutting for Il Giardino Toscano restaurant in Nobleton . You just can’t bring the beautiful scenery of Tuscany to King Township. But you can create a welcoming atmosphere and serve up some international dishes with a European flare. 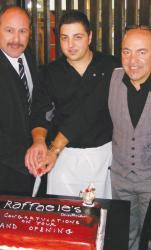 That’s the goal of Il Giordano Toscano Ristorante, and owner Lorenzo Lorenzini. The veteran in the hospitality industry, Lorenzini is optimistic his new venture will be quite successful. And why not? Lorenzini is backed by more than 30 years in the hotel and restaurant industry, where he’s served two to 2,000 in fine style. He’s outgoing and passionate about the evolution of his new restaurant. The native of Florence, Italy, received his hotel training in England and went to work in London’s core. When the 1981 recession hit, Lorenzini decided to take the loss and move to Canada. He was ready to leave his mark on his new home and came ready to invest. He worked for some well known Toronto hotels before opening the very popular Barolo restaurant which he operated through the 1990s. After his eatery closed in 2005 he went to work for the Hilton. When the Nobleton restaurant (formerly Daniel’s of Nobleton) became available, Lorenzini dove right in. He’s spent the last two months revamping the eatery, making it comfortable, inviting and friendly. While it’s not Tuscany, little reminders of the Italian countryside abound. When you build a restaurant, you build a clientele. Lorenzini pays attention to every detail. The menu is a definite crowd-pleaser. While it concentrates on traditional Italian dishes of pasta, fish and veal, food-lovers can also sample some exotic dishes such as roasted quail, caribou, buffalo and rabbit. You’ll also be tempted by the baccala (dried salt cured codfish, served Florentine style), or their chicken supreme, (Ontario grain-fed free range chicken with mushrooms in a light white wine cream sauce). Lorenzini said he’s flexible and will keep an eye on just what customers want. The quaint restaurant seats 45 and there are plans to expand the bar area. Next summer, Lorenzini will open a beautifully decorated outdoor patio, licenced for 61. The property can also accommodate outdoor events. The tasteful decor is complemented by a nice wine list, which includes some top brands from Italy, Canada, France and Australia. Lorenzini plans to open daily from 4 p.m. to midnight and again, should demand arise, he’ll alter his schedule to accommodate Sundays and lunch crowds. Il Giordano Toscano (Tuscany Garden) is also ideal for parties, functions and gatherings. Keep them in mind as the holidays near. King officials and members of the community will join in welcoming Il Giordano Tuscano on Saturday, Nov. 16 for their grand opening and ribbon cutting. the emphasis to re-using brownfield sites is to be commended. When I look at the maps that are part of tonight’s submission it reminds me a bit about the fairy tale of Goldilock. One map is too big, a second one too small, and the third one is just about right. The King City area is rather large given the location of today’s businesses, the Schomberg area is about right for its concentration of business but the Nobleton map is a little tight. I would hope to see the Nobleton boundary expanded to include more of the area along county road 27 as business has evolved from the traditional corridor along King Road to more businesses locating along 27. The structure of a CIP will provide flexibility. Once the structure is in place funding can be increased or decreased as fits with the many competing budget requests you see each year. This type of program does not lead to ongoing costs but rather to an approach to support the sustainable business practices all want to see. The King Chamber of Commerce will be happy to play a role in the consultation that is part of the CIP outlined here this evening. This is a good step to making the Economic Development Strategy tangible. Good evening Mr. Mayor, Counsellors, and staff. My name is Tom Allen. I am here on behalf of the King Chamber of Commerce to talk briefly about the sign by-law. First, I think it is good to see the Township updating some of the older by-laws like the sign by-law. Through discussions as part of the Economic Development Strategy we saw having current laws and regulations are important to our local businesses and will be helpful to the smooth operations of both the Township and local businesses. There are several points that I think are helpful in the draft by-law. For example, expanding the size of signs allowable for Real Estate, particularly in rural settings, is positive. Another example is signs for farm produce as there is a growing trend to using local food. One key item in the by-law is the recognition of the needs of home based businesses. I knew we had many homebased businesses in King, however, it wasn’t until the Economic Development Strategy work that I realized it was 1600 business locations. The inclusion of a Home Occupation section of the law is a good move. I would ask that there be better clarity around what is accepted. Businesses, including the smaller home based businesses, put significant emphasis into creating a brand. A home occupation sign should be able to use a business name or logo as well as an individual’s name, hours of operations, a website, phone or email and the business sees fit. While it does belong in law, I would hope the regulations include the timeframes with which a business can expect service from the Township on a sign permit once complete information is provided. We appreciate the work to update this by-law. Please add clarity for the home based businesses. On August 13, 2013, the Ontario Chamber of Commerce hosted a teleconference call with the Chamber Network and Porter Airlines to discuss Porter’s expansion plans for the Billy Bishop airport in Toronto. Several questions were raised by the group after the call. We sent your questions to Porter Airlines, who have in turn provided us with answers. See the attached document. The OCC is currently reviewing Porter’s answers. If you have any further questions on this matter for either the OCC or for Porter Airlines, please contact Josh Hjartarson (416-482-5222 ext 2320) or Liam McGuinty (416-482-5222 ext 2380). My name is Nancy Belo Gomes and I volunteer with King Township and its Sustainability initiatives. As members of King’s Chamber of Commerce, I’m reaching out to you to ask you if you know of any businesses in King who would like to have a Seneca College student study their business from a sustainability perspective. Attached is a course outline. Ted Tom is the professor of the course title “Exploring Environment Relationships” of which sustainability is one component. I think this is a win-win situation. The business owner gets free sustainability advice and the student gets to apply his/her college education to a real life “client” situation. The school is looking for 10 businesses. I’ll be volunteering my own family business – Port Soiree Restaurant in Schomberg. So, that means 9 more to go. If you know of any businesses who would be interested please let me know as soon as possible since I have to get Prof Ted a list ASAP. Students may choose from a number of applied research topics around sustainability. This project is intended to be a semester-long, in-depth study of one aspect of sustainability that is of interest to the student. Students may choose to perform a self-study, a business audit, a community or campus evaluation, or other. Research projects have to contain an element of applied research in addition to traditional literature review. Students are expected to produce a 10-minute PowerPoint (or other multimedia) presentation of their focus, methodology, key findings, and recommendations for future research. Peer review will be a part of this grade calculation. If you live in King Township, you likely don’t work there. One in eight residents actually work in the municipality. The municipality has released a 130-page economic development report to figure out how to attract more businesses to King. With less than 13 per cent of township revenues coming from non-residential taxes, it is imperative the township brings in more jobs, the report stated. There is a plan and vision of how the township will move forward, Mayor Steve Pellegrini said, adding the report puts building blocks in place to help develop business opportunities. A lack of serviced employment land, limited broadband capability and high land costs are reasons businesses continue to shy away from King, the report stated. The report championed the importance of creating viable economic environment, which struck a chord with chamber of commerce vice-president Tom Allen. “The key thing is they are saying the town is open for business, but I don’t believe that is the perception out there,” Mr. Allen said, emphasizing businesses want things done in a timely manner and that takes a certain amount of municipal co-operation. With 87.2 per cent of the township’s revenues coming from residents, its small population base has put a significant burden on its fiscal framework and the township is running an eyebrow-raising $1,349 debt per person. That means, to pay off the debt, each resident would have to pay $1,349. To put this in perspective, Caledon runs at $352 surplus per person. Aurora runs at $958 surplus per person and Stouffville is at $599 debt per person. It is not all doom in gloom, though. The report outlined four goals: investment readiness, a commitment to community and sustainability, a culture of entrepreneurship and a strong innovative rural brand. There were many steps outlined to achieve these goals, including creating a corporate gateway to the community, leveraging the post-secondary presence of nearby Seneca College and enhancing broadband capabilities. It is important to work with the more than 1,400 home businesses in the municipality to show off the township’s rural character, Mr. Pellegrini said. The King Chamber of Commerce is looking to partner with the Township of King to acquire a business development coordinator. Lucy Belperio, president of the Chamber of Commerce, made a presentation at the Dec. 10 council meeting to propose the joint venture as the township deliberates the 2013 budget. business expansion and retention efforts, seek funding available from other levels of government for the business environment and increase the King Chamber’s membership so that future government funding would not be required. One of the major roles of the coordinator would be to bring tourism into King through the Pan Am games, N6 (Northern 6 municipalities) activities and tours or day trip initiatives. recognizes and appreciates the Township’s support and assistance to date. with the launch of an economic development strategy review. “I believe this project has been tendered and we look forward to the development process and its results,” she said. of a business development coordinator. deal about our community and they regularly contribute their professional skills and a lot of hours of their personal time in order to facilitate a financially healthy King Township,” said Belperio. “The Township has advocated on behalf of this industry. to not have a paid executive such as a president. The presentation was received by council and referred to budget discussions. The King Chamber of Commerce wants the township to step to the plate and help it hire a full-time business developer. engagements during the year, chamber president Lucy Belpeiro said, adding it would be someone to further develop strategies for the future. get the project started, Ms Belpeiro said, suggesting $50,000 annually, with the intention to make it significantly less through the creation of ongoing revenue. township is not in a position to help right now. closely with Mr. Smyth on achieving its goals. money. We had to ask. I don’t know what the outcome will be,” Ms Belpeiro said. 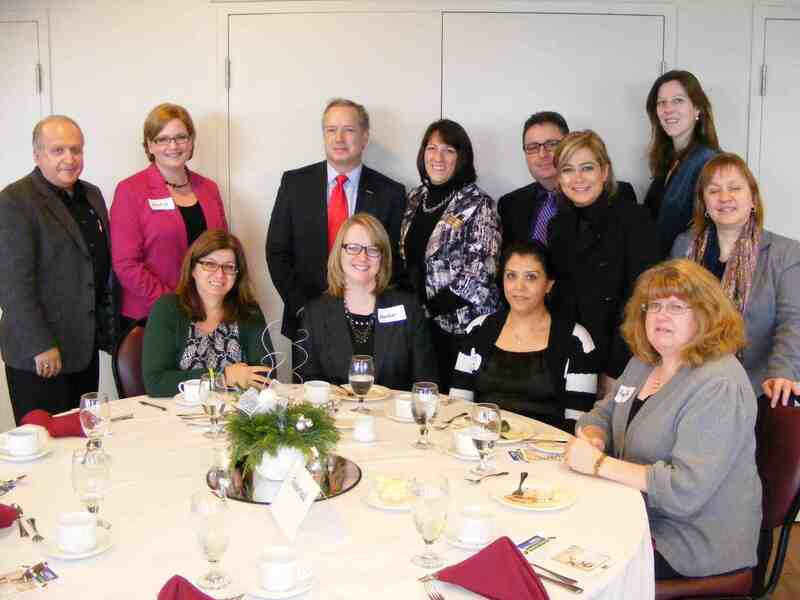 The King Chamber of Commerce would like to thank all of the members and guests who attended our 2012 Christmas Luncheon. In particular, we would like to thank Mayor Pellegrini for joining us and sharing some of the Township’s current successes and plans. He was speaking to a full house, as we had more attendees this year than ever before, and he did a fantastic job of addressing and showing support for all of us. We are very happy that the generosity of our business community has provided help to the community as a whole, and we are very impressed by your strength and your continuing thoughtful support. 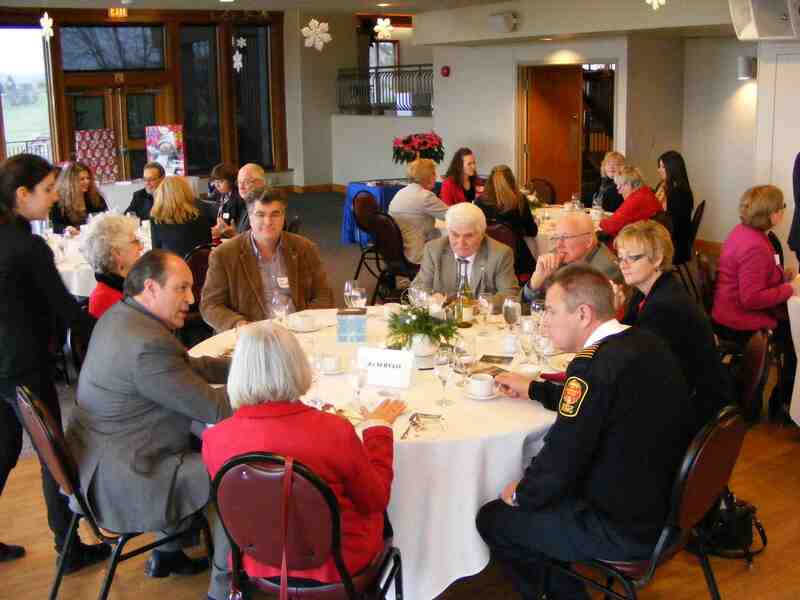 This Christmas luncheon was a wonderful event that allowed for a coming together of many different people from our community; long-standing members, guests, and new members all took the opportunity to step away from their day to day responsibilities and enjoy a casual festive atmosphere. Thank you Cardinal Golf Club for the wonderful Christmas lunch, and thank you members, for your continued support and for putting aside your considerable work and economic concerns in order to come and celebrate the holiday season with the larger business community here in King Township. From the King Chamber of Commerce, have a wonderful holiday season. We look forward to working with each and every one of you in the new year. and Emergency Services. These will find their way into the hands of needy children in Nobleton, through the Nobleton Christmas Drive. “I’m humbled and grateful for the amount of toys our Chamber can contribute to families in need,” said president Lucy Belperio. overwelmed by the generosity. Thank you to everyone that attended this event. 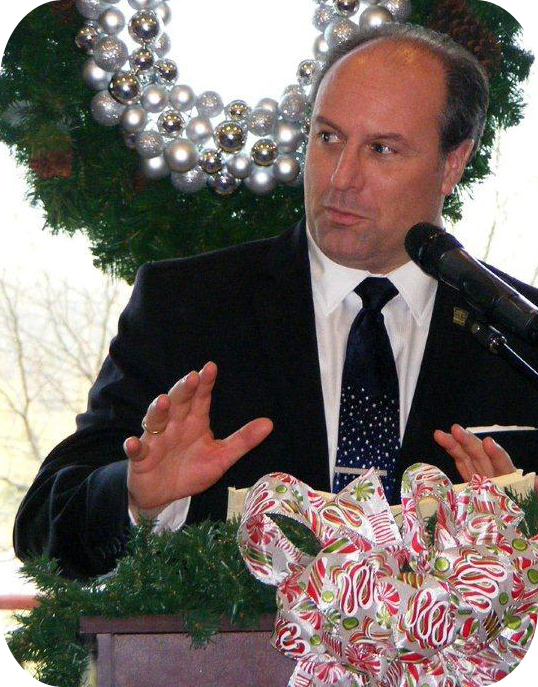 Mayor Steve Pellegrini spoke at the luncheon saying that there have been many milestones in King in 2012, including the creation of the busines s retention and expansion plan. 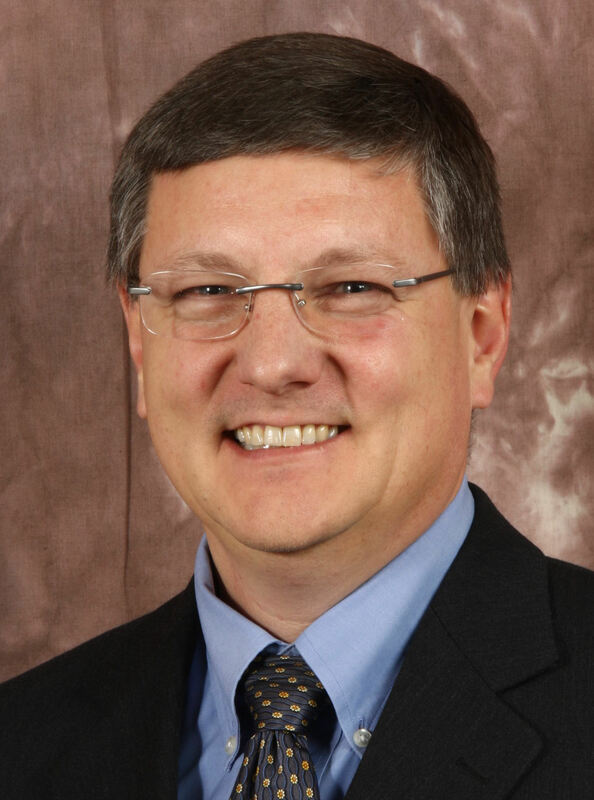 The Township is in the midst of its first economic development strategy. The mayor encouraged Chamber members to provide their input to Jamie Smythe, economic development officer. As partners, the Township and Chamber are proud of the 2012 business directory, distributed to households recently. He praised the efforts of Chamber board members and he once again urged everyone to shop locally. 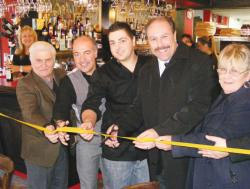 Councillor Peter Grandilli, owners Louie and Raffaele Maietta, Mayor Steve Pellegrini and Patty Fleetwood, King Chamber Board Member.